And then came Henrik….We had a pin cushion swap at this month’s PMQG meeting. I received this cute pin cushion from Violet Craft. 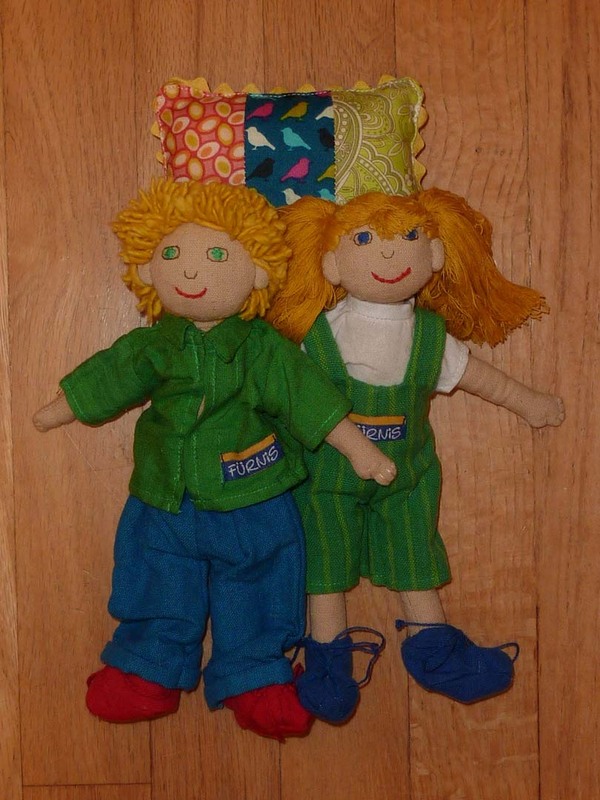 It used to look like this (4th pin cushion photo). When I got home from the meeting, Henrik immediately asked if he could have it as a pillow for his “buddies”. I told him that it was a pin cushion and that he could borrow it for now. The next morning he was playing with it and I heard a “pop”. Now it looks like this. Without the button, it really does look like a fancy pillow. Thanks, Violet we have a new doll pillow in our house. I made this pin cushion for the swap. 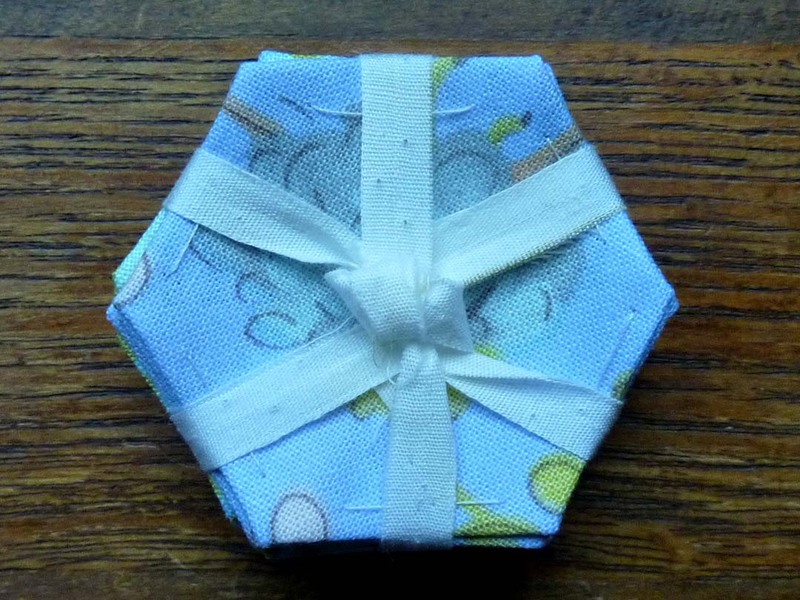 I got the fabric at the Charm Square swap the May PMQG meeting. I took a break from Henrik’s lunchbag, which I started at the September Modern Domestic Open Sew (and still haven’t finished) and got to work on the pin cushion. I used my walking foot for the lines. I noticed that my stitch was very uneven, but I was a little blurry eyed so I didn’t “really” notice until I was done with one and about halfway done with the second one. It was bad enough that I decided to take my machine to Montavilla for a checkup. I had to wait for Rob to be here because I couldn’t carry my machine because of my neck. I had just had it overhauled in April so I was surprised that is we acting up. The technician worked on it on the spot, replaced 1 part, which was the hook (behind the bobbin case) and almost $100 later, I was out the door and I was ready to try again. I ripped out the seams from the first attempt and started again. I got about as far into the process for the second time and decided that the stitch still wasn’t right. I was getting a little stressed because I had a pin cushion and a Halloween costume to finish (and the lunch bag too–oh, and the quilt I started for Henrik’s birthday). It was midweek (Rob was in Eugene) and I put my machine on a hand cart and took it back to Montavilla. I dropped off the machine so that it would get a thorough check up. Loading the machine on and off the cart was really too much for my neck so I had to wait for the weekend to get my machine back when Rob could do the loading and unloading. This time they replaced (at no charge) the walking foot, which I had bought at Montavilla about a year and a half ago. 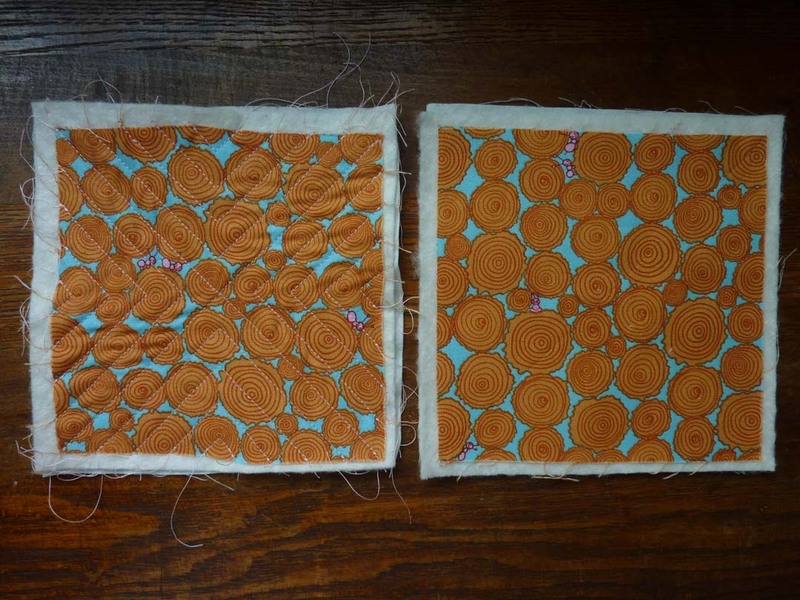 I ripped out the seams of the pin cushion for the second time and started again. This time I got a beautiful stitch and I love how the pin cushion turned out. I washed it to get the best “quilted” look. 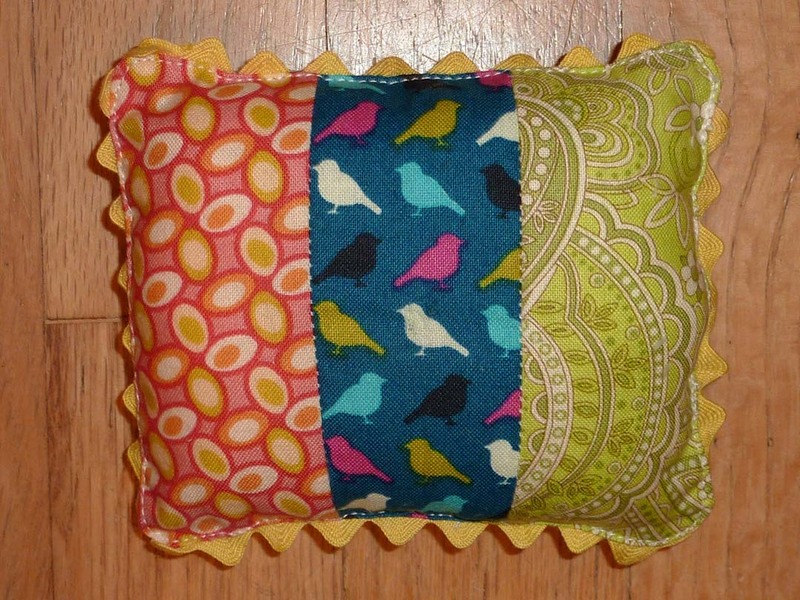 I stuffed it with buckwheat, which was left over from my birthday eye pillow and then stitched up the 4th side by hand. I sewed 1 pink button in the center of the front and the back by hand. I was trimming my threads while eating dinner just before the meeting. Monica Solorio-Snow presented about designing Holiday Happy fabric line at the evening’s meeting and she stated that she loves aqua and how she used it in her current fabric line as a non traditional holiday color. It was quite fitting that she picked my pin cushion from the table of brown paper bags. 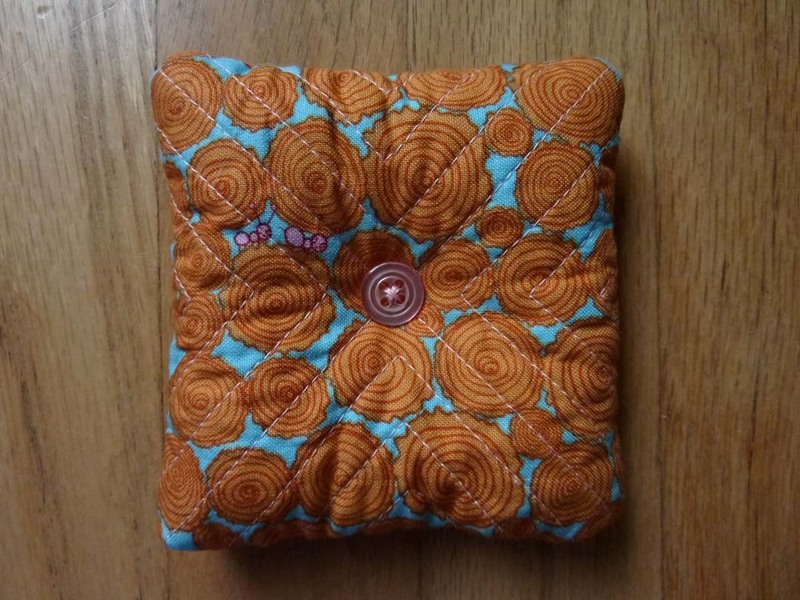 It looks like my pin cushion, sewn three times for good luck, went to a good home. Enjoy, Monica! 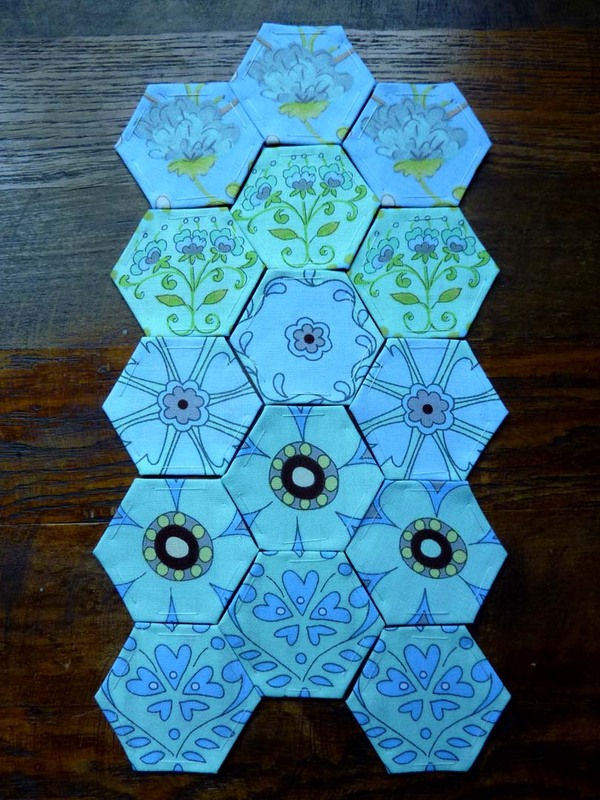 We swapped hexagons at the August PMQG meeting . Here are the ones I made. I bundled then up for the swap. I am not sure who got them, but I hope they are being loved. I used the fabric I won at the PMQG Modern Domestic Open Sew in June. I have been challenged to learn new skills at each of the PMQG swaps. 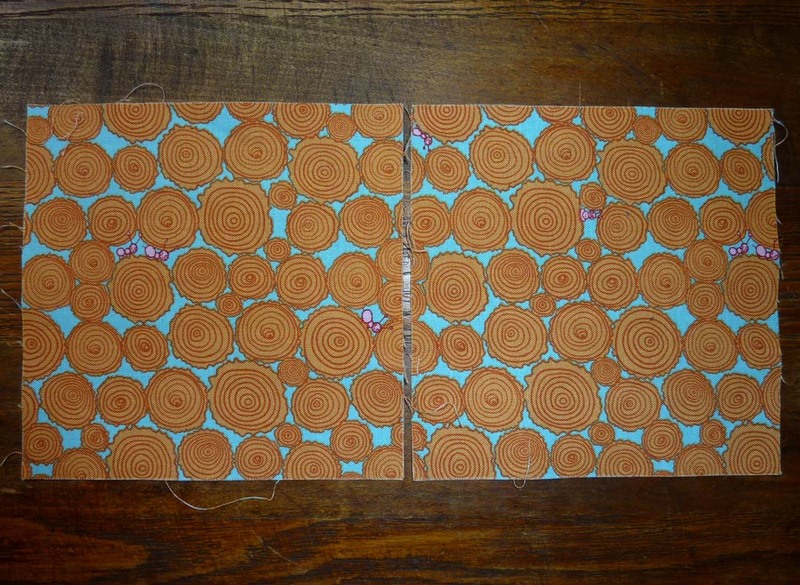 Come join us if you would like to grow your sewing/quilting skill set. The next meeting is November 16th. This entry was posted in Create, Learn, Quilt, Tutorials. Bookmark the permalink. I bundled them up for the swap. 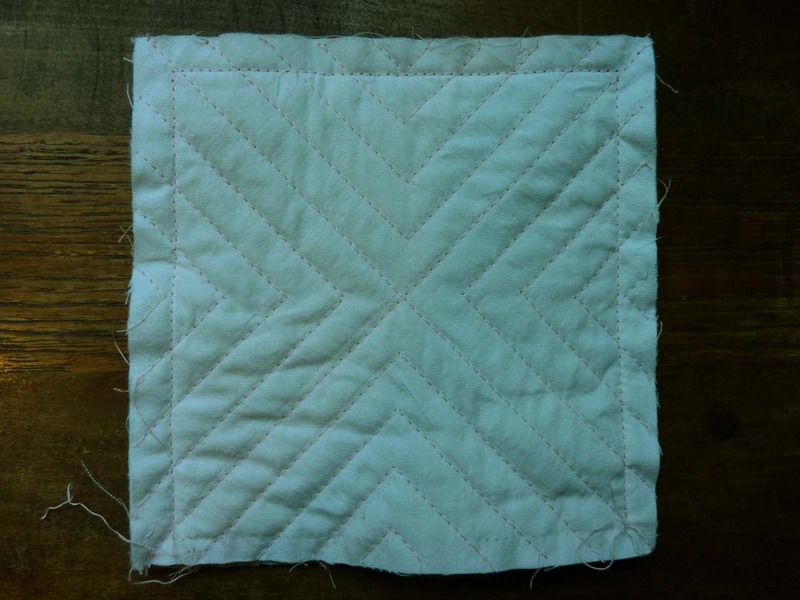 This entry was posted in Create, Learn, Quilt, Tutorials, Uncategorized. Bookmark the permalink.